Overturned car in East Ashling, this morning. Picture by Bob Money. Sussex Police confirmed it attended to an overturned car this morning (Wednesday). 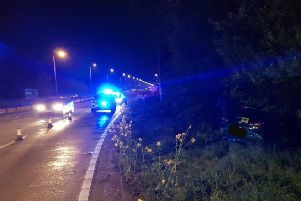 The vehicle 'rolled onto its side' after coming off a road into a field next to the B2178 in East Ashling, according to police. Police said it wasn't made aware of any injuries, but confirmed the ambulance service attended the incident, which it said took place at around 8.30am.